Lucy's birthday party is coming up in a couple of days. She wants an apron, and those things you wear on your hands (oven mitts). My daughter said it should be bright and colorful and wanted to make it herself but there just isn't much time and I was busy getting ready for a rather large gathering at my house so I couldn't really help her. There were a couple of child's apron blanks in my sewing room but they were rather plain. Embroidery could fix that but it still had to be pretty fast if Andrea was going to make those mitts as well. 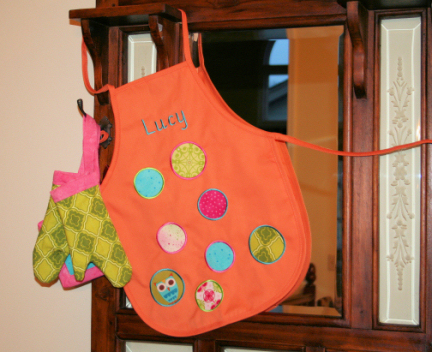 She isn't much at creating her own designs so she just made some appliqué circles (which you can download below) and embroidered them along with Lucy's name to create a cute apron that any little girl would love. Note: If you decide to make these just be sure that the magnets are small enough that the embroidery foot of your machine clears. You might want to read this blog to see how we did the magnets in "gone fishing". The free downloadable pdf pattern we used for the mitts can be found here. There is an apron pattern included so no worries if you do not have a blank like Andrea used. If you are new to embroidery appliqué and would like a little tutorial on how to sew and trim the appliqué circles read my "Sewing for Sunday" blog post. It has the instructions you might need. 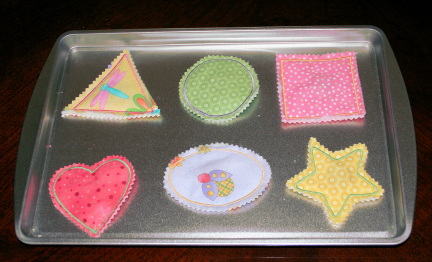 Any of these are quick projects when you haven't much time or when you have a child who wants to embroider. Whatever type of embroidery you enjoy be sure to share it with others by posting your finished project in the gallery.